Have a few strange looking brown spots which won’t grow no matter how much you water them? It’s possible you have grubs. Grubs are white colored insects usually seen in a curled manner resembling a “c”. In fully their fully matured form, they are found as June bugs or Japanese beetles. They feed in the soil beneath grass, eating organic substances usually including grass roots. Look out for these signs which often mean your lawn has a grub problem. A lot of Japanese Beetles: Grubs are the young form of beetles. If you have a lot of beetles, they will be laying eggs in the fall which will begin feeding on the grass roots. Grubs can grow into either Japanese beetles or June bugs. Brown patches of grass: Often, irregular patches of brown or dead grass indicates a presence of grubs. They have likely destroyed the roots beneath the brown grass. Grubs are not the only reason for brown grass, but a combination of the two signs and they are usually the culprit. Grubs start as larvae underneath the soil. The eggs hatch in the fall and begin feeding on grass roots, the habit which leads to your lawn being destroyed. In the spring, the grubs awake from their winter slumber and resume feeding on the roots of your grass. They then transform into pupae. During the summer, the pupae transform into beetles. These beetles will begin eating flowers and other vegetation, while simultaneously laying eggs. In the fall, the process begins again with the new eggs. Fortunately you can see grubs if they are present by removing a small patch of lawn. A few grubs (5 or less per square foot) is okay. A robust lawn can support a limited number. More than 10, and you need to use treatment. There two types of treatments which are available. One is of a curative nature. This will kill the grubs immediately present. The preventative type will kill the grubs more slowly, but it will also stay in the soil for longer, limiting the future eggs for the season. Since grubs normally begin hatching and feeding in the late summer and fall, this the best time to apply preventative substances. 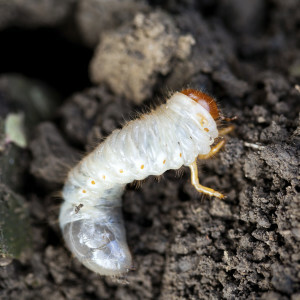 The grubs are young and are more susceptible to the grub control. This will break the cycle saving your grass for next year. Beware if you notice a neighbor’s yard showing signs of grubs. The beetles will likely look to lay eggs in a well maintained garden, especially if you water regularly. Larvae do well in damp soil. If you are passionate about your landscape, or if you simply want to have a nice, healthy lawn, make sure to keep an eye out for signs of grub damage. If you think you may have grubs and would like professional help with the problem, the landscape experts at Greener Horizon in Middleboro, MA can assist you with grub control. We use the best products to ensure safe, thorough, and lasting results. Take the first step to achieving a beautiful lawn by contacting us today!